Impress someone special with a European classic: Baci® by Perugina® Chocolates, produced in Perugia, Italy for over 90 years. Each foil wrapped delight is a perfect combination of dark chocolate and a creamy gianduja & chopped hazelnut filling, crowded with a crunchy whole hazelnut. Each Baci® Perugina® has captured the imaginative, romantic spirit of the chocolates themselves and is wrapped with a Love Note in four languages. Baci means ""kiss"" in Italian and ""delicious"" worldwide. 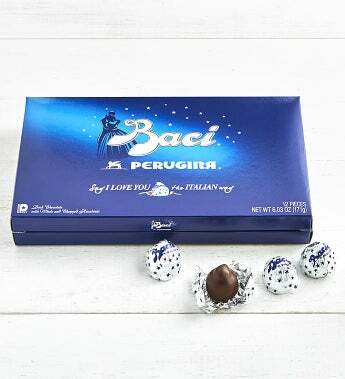 Impress someone special with a European classic: Baci® by Perugina® Chocolates, produced in Perugia, Italy for over 90 years. Each foil wrapped delight is a perfect combination of dark chocolate and a creamy gianduja & chopped hazelnut filling, crowded with a crunchy whole hazelnut. Each Baci® Perugina® has captured the imaginative, romantic spirit of the chocolates themselves and is wrapped with a Love Note in four languages. Baci means "kiss" in Italian and "delicious" worldwide.